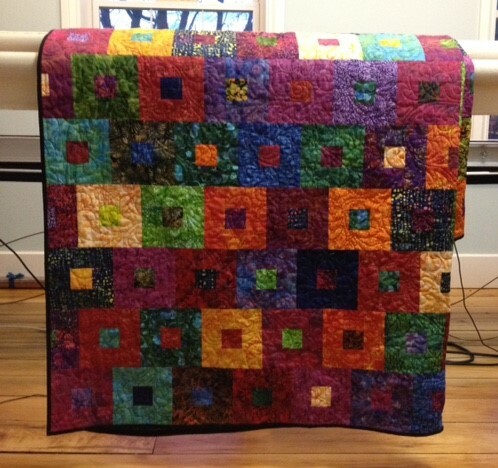 Quilting Adventures: Stop the earth, I want to get off ....! I agree. There is so much and so little time! I know that feeling, I have so much to do and want to do and so much that inspires me, so I need to step back and do what is important or just fun and not stress about what I can't do;) Love the quilt and the batiks, I do have a collection I have been adding to, so another to do on my list. I can't imagine how a designer can come out with new (and good) designs every 3 months! I just wish I could make something as beautiful as you did! Wow! I agree! The whole thing makes me crazy. It's like they're all in some big competition to beat out the next guy -- what's next? New collections every week that are only available for a day? There's so much to look at and if you blink you'll miss a collection and then it will no longer be available. It's insane. I love so many of the new fabrics, but I'm running out of room -- not sewing fast enough? How many quilts and how much fabric does a girl neeeeeeed???? I miss the anticipation of waiting for the new season releases. There is a lot to be said for having seasonal events instead of a constant stream. Now there is new fabric every time I go online! I don't need or want all that fabric and I really don't think anyone else does either. It is all driven by textile companies jumping on the quilting dollar, and I don't blame them all for chasing business. But they might get more of mine if I had the chance to plan and anticipate two or three times a year and get quilts made between advertising assaults to buy more. My stash is now enormous and I have had to almost stop buying except for the occasional "must have" (thanks for the Midwinter Reds FQ tower!!) Flooding the market with new fabric must also make the running of bricks-and-mortar quilt shop difficult. My new mantra - slow down and enjoy a little less a lot more.